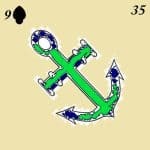 The meaning of the thirty-fifth Lenormand card, anchor, is stability. Anchor also signifies what is long lasting. Anchor Lenormand Card In The Grand Tableau. Anchor in Rider position: Permanent changes. Anchor in Clover position: Long-term fortune. Anchor in Ship position: Long journey overseas. Settling overseas. Anchor in House position: Stable home. Long term home. Stable family. Security. Anchor in Tree position: Long lasting health. Strong health. Anchor in Clouds position: Stability shaken up. Uncertain foundation. Long lasting confusion. Anchor in Snake position: Lying to stay safe. Compulsive liar. Anchor in Coffin position: End of stability. New beginning. Anchor in Bouquet position: Long-term happiness. Anchor in Scythe position: Confident decision. Very experienced surgeon. Anchor in Whip position: Long lasting conflict. Anchor in Birds position: Stable couple. Anchor in Child position: Safe childhood. Confident child. Anchor in Fox position: Long-term job. Anchor in Bear position: Stable boss. Powerful and strong. Anchor in Star position: Long lasting dream. Anchor in Stork position: Big changes. Anchor in Dog position: Long lasting friendship. Anchor in Tower position: Stable government. Anchor in Garden position: Traditional events. Anchor in Mountain position: Stability delayed. Anchor in Crossroad position: Having to make frequent choices. Anchor in Mice position: Stability lost. Anchor in Heart position: Strong love. Deep love. Anchor in Ring position: Long-term marriage. Long term contract. Anchor in Book position: Long-term study. Long term secret. Anchor in Letter position: Documents that bring stability. Anchor in Man position: Stable man. Anchor in Woman position: Stable woman. Anchor in Lily position: Stable retirement. Stability later in life. A long retirement. Anchor in Sun position: Long lasting success. Anchor in Moon position: Long lasting romance. Anchor in Key position: Stability being important. Anchor in Fish position: Long-term business. Stable business. Anchor in Anchor position: Stable work. Anchor in Cross position: Long-term worry.